How has each Manchester United player fared so far this season? 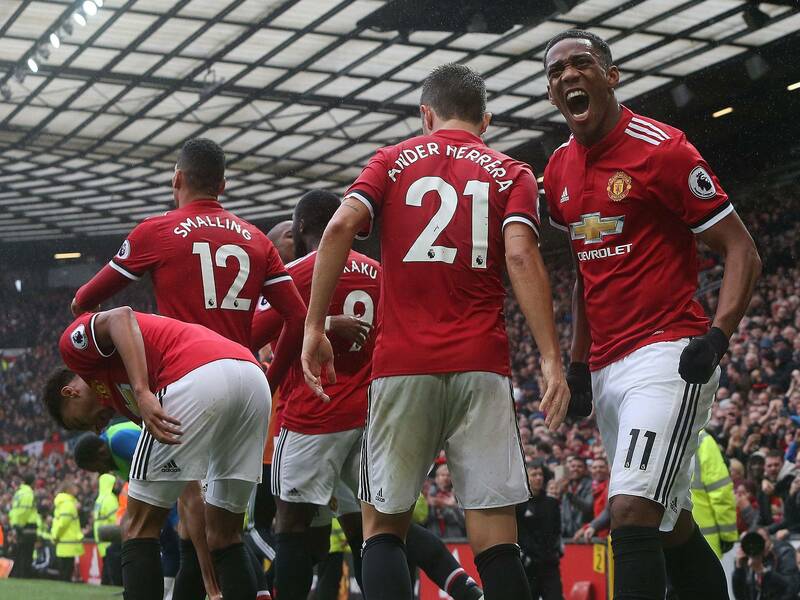 Whilst currently lying second in the Premier League table and on course to qualify to the knockout stages of the Champions League, Manchester United are certainly making progress this season and perhaps some of the criticism aimed towards the current side has been a little unwarranted. With continuous injuries and setbacks however, the team have had to endure changes and tweaks to their lineups on a rather consistent basis so far this campaign. So how well has each individual perfumed this season? Take a look at our ratings below. In a season in which Manchester United’s defensive record has been a particular highlight so far, one man as ever has played his part in this – David De Gea. The Spaniard has yet again enjoyed a fantastic start to the season in a United jersey and it can be said with some confidence that he has performed at a world class level for the last four years now. Whilst arguably being the best goalkeeper in the world at present, United will always be considered a tough team to beat, whilst De Gea remains between the sticks. Similar to De Gea, one of United’s most consistent performers across the last few years has certainly been Valencia, who has had the right-back spot nailed down as his own across the last couple of seasons. Operating down that right-flank, Valencia has again showcased both his offensive and defensive duties this season and will certainly be contending for a TOTY place, come the end of the campaign. As a player who naturally spurs some questioning from fans themselves, Smalling does deserve an honourable mention this season, offering his services in a professional and reliable manner whenever called upon. Although the Englishman may not have a starting position on lockdown when everybody is fit, the 27-year-old has been a solid performer this year and also an effective choice, when United have opted for a back three. Arguably the best defender United have possessed since the days of Rio Ferdinand and Nemanja Vidic, Bailly is certainly Jose Mourinho’s first choice centre-half and rightly so. The Ivorian is quickly becoming one of Europe’s most promising defenders and despite being just 23, he looks to progress ever further with every game he plays. Although Bailly seemed to take to life at United like a fish to water, unfortunately the same can’t be applied for Victor Lindelof, who looks like he’ll need to use this season as a settling down period, before making any ground on getting into the starting lineup. After a disappointing performance against Huddersfield, United’s first defeat of the season, the Swedish international looks to be down the pecking order, but don’t write the 23-year-old off just yet. When injuries aren’t tampering with Phil Jones’s form, the Englishman is one of both the League’s and nation’s most solid defenders. After enjoying a bright start to the season, helping United achieve seven clean sheets in the opening eight Premier League games, it looked as though Jones had certainly turned a corner during his career. However, as it seems to happen so often, Jones has currently been kept on the sidelines following a calf injury, fans will just be hoping it isn’t a lengthy setback. The left-back spot at United has been a place up for grabs over the last few years and this season, Ashley Young has stepped forward and taken it as his own. Whilst many pundits and fans alike had written Young’s career off, the veteran has offered his ever-reliable services at the back and received an England call up in the process. Having started just three games across all competitions so far this season, Matteo Darmian’s future at the club is seriously in doubt, as it appears he doesn’t belong in Mourinho’s long-term vision at the club. Both Valencia and Young’s run of form also suggests that we wont be seeing much of Darmian on the field any time soon. Similar to Darmian, Daley Blind is another player struggling to receive minutes at present for United. Operating in a rotational role for the side, the Dutchman is certainly a solid backup, but also a player who may be considering his options if he continues to stay out of the starting lineup. Arguably one of the signings of the season so far, Nemanja Matic has certainly silenced any doubters that questioned his switch from life at Stamford Bridge to Old Trafford. The defensive midfielder’s towering yet composed playing style has offered some solid assurance in the middle of the park this season and the Serbian will be pivotal to any success United are destined to achieve this campaign. If you’re one for backing the underdog, then Marouane Fellaini’s journey at United is certainly a story for you. The big Belgian has been a revelation under Mourinho and has showcased how much of a nuisance to play against he can be this season. Fan’s reactions to his injury certainly sum up how much they have warmed to Fellaini over the last year, after proving himself as an effective tool to have in the squad. It’s unfortunately been a slight fall from grace for Ander Herrera, who has failed to recapture his sparkling form from last season. The arrival of Matic has seemingly knocked the energetic Spaniard down in the pecking order, with the two also struggling to establish an effective partnership together. Despite still being valued by Mourinho, many fans have voiced their disappointment with Herrera’s form this season. Despite being a fan favourite amongst the Old Trafford faithful, Mata has endured a slow start to the 17/18 campaign and has failed to nail down a consistent run in the side. Whether it being out on the right or deployed centrally, the Spaniard always brings a touch of class and tidiness to United’s play, but perhaps it will take an improvement in his final product if he were to break back into Mourinho’s lineup. Fans across the league are finally seeing what United fans have been crying out about for the past 6-7 months – the true ability of Paul Pogba. After an explosive start to the Premier League campaign, the Frenchman’s form has been haltered after a hamstring injury that sidelined the midfielder for two months. However when fit, Pogba is undoubtedly United’s key cog in the middle of the park and his return to first team action is something fans have been anticipating ever since his injury. With six assists so far this season, a low rating may not seem so warranted for the creative Armenian, but Mkhitaryan currently looks a player rather lost and out of his depth in the current United side. No fan can doubt the playmaker’s natural ability, but he will need to recapitulate his early season form, to win fans back over. Despite just starting six games so far this season, Martial is finally starting to show glimpses of his quality, similar to what fans witnessed during his explosive debut season under Louis Van Gaal. Whilst there are still moans about the 21-year-old’s game time, Martial has been an effective tool coming off the bench during his battle with Marcus Rashford for the position on the left hand side. Now into his first full season as a United player, Rashford is showing no signs of faltering or falling into trap of a ‘one season wonder’, but instead, the academy star carries on to prove his incredible talent. Despite being far from the finished product, Rashford’s all round ability of pace, skill and work-rate have collectively resulted in the Englishman becoming a favourite under Mourinho. Operating in a rotational role under Mourinho, Lingard is still a player that continues to divide fan’s opinion. Whilst not particularly being blessed with the explosive talent of a Martial or Rashford, the Englishman is still a player that every manager values to have in their squad. Although Lingard will receive chances from now till the end of the season, he is still yet to warrant a higher score than 5.5. Having been one of the most talked about players of the Summer transfer window, the step up from Everton to Manchester United has not fazed the big Belgian, Romelu Lukaku. Snapping his goal drought with a terrific finish against Newcastle this weekend, Lukaku has now registered eight league goals so far this season and is providing the difference in finishing off the so called lesser teams, United’s main problem last year. These goals in the early stages of Lukaku’s United career provides him with a rating of 8, but fans will be expecting to see a bigger contribution from him in the bigger games and will be considered the next step in his own game, before being labelled as world class.